Stay tuned to Cute Crochet Chat. On July 3rd, we will be announcing a new contest giveaway here at Cute Crochet Chat! Be sure to check back for your chance to win! 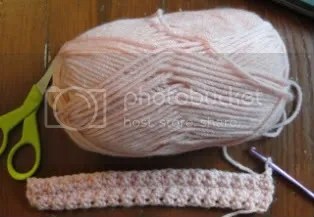 Today I am working on a crochet project using Vanna’s Choice worsted weight by Lion Brand, a yarn that I have not tried before now. I had been told it was a nice, quality acrylic yarn and after crocheting with it for a couple of hours, I am inclined to agree. I am working on a home decor design for my column in Crochet World magazine in a specific stitch pattern. Vanna’s choice is producing a very nice stitch definition; the stitches are crisp and clear, which is so important when working on multiple stitch patterns. Overall, the yarn is much softer than I thought it would be, making it nice to crochet with. The yarn, itself, is a bit fuzzier than most acrylic worsted weights that I have worked with before, but not enough for me to dislike ‘the look’. The crochet fabric has a nice stretch to it, and yet is full bodied at the same time. As with most acrylic yarn on the market today, it is machine washable and dryable, making it a good choice for a good quality afghan or other home decor items. Vanna’s Choice comes in a wide variety of beautiful colors, making it even more appealing for your typical projects made with worsted weight acrylic yarn. Have you heard about Knit in Public Day? It is a day (weekend, actually) for everyone who knits to show their support for our craft! 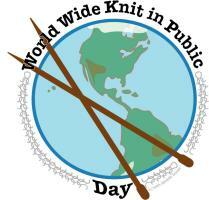 This year, two weekends are being designated as Worldwide Knit in Public Day, June 13-14 and June 20-21st. You can learn all about it HERE. Perhaps you are one of the lucky ones that have a LYS sponsoring an event. So pick up those sticks starting on June 13 and knit away!